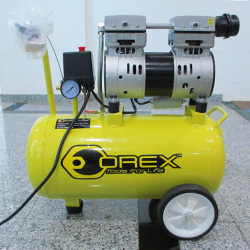 Air compressor Singapore ready source of compressed air and portable for your onsite pneumatic tools requirements. Ranging for the popular mini model at just 15KG churning out 8 bars or 115PSI of compressed air in a 9L tank to a whopping 90L tank. Our range of portable air compressors in Singapore will meet or even excel all your compressed air needs. Ranging from small 9 litres tank to a whopping 60 litres you can be sure whether you are a hobbyist doing spray painting at home or professional handyman working on-site our reliable portable air compressors will more than meet your needs. Oil free mini air compressor good for modelling spray painting and light nailing jobs. At 15kg, the mini air compressor is very portable and easily fits into any car. 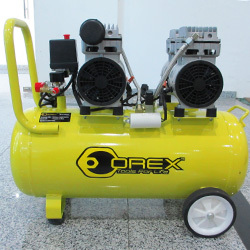 Oil free portable air compressor with larger capacity tank. Same low noise air compressor motor that is even quieter than a hair dryer. This is slightly heavier than the mini air compressor at 20KG but still manages to be portable. Our larger capacity portable air compressor featuring the same silent air compressor motor that is no louder than the smaller capacities. Good for work sites that requires a quick and convenient source of compressed air for spray painting. This larger portable compressor comes in at 46kg and is recommended to be carried by 2 persons. For small shops that do not need large quantities of compressed air, a large permanent air compressor fixture may not be required. 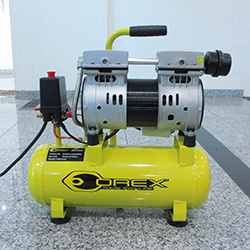 The uses of the portable air compressor are limitless, at such a mini-size, you’ll definitely find it very handy and thought why haven’t you gotten an air compressor earlier! When choosing a tank capacity for air compressors, you need to know what your application is. If you need lots of compressed air for extended periods of time like spray painting you might want to go for a larger capacity so you don’t have to wait for the tank to recharge while you are in the midst of painting. That being said, our smallest model the Mini Air Compressor is popular with hobbyist spray painting because of it’s silent compressor pump and will fit under a work desk easily. The typical flow rate of all the above models are at about 60L/min from the factory specs. So you should be able to calculate the amount of air you need. Air Compressor Noise Level – Which should you choose? Although we specialise in the low noise versions of air compressors, we do have the usual macho buzzing air compressors that generates enough noise to wake up the neighbourhood. If you need the hyper version of the above models, they are available with the same specs in tank capacity and pressure but produces a lot more noise. We have no idea why you would want a noisier version but yeah, it’s available if you need them 🙂 Just kidding, the real reason why you should choose a noisy compressor versus one that’s quiet is the use case. If you use the air compressor for light usage, ie: less than 5 tank recharges per hour, you’re good for the silent compressor model. 1 tank recharge is when you use up the compressed air and the compressor kicks in to top up the tank back to full level. Each time the motor activates until it cuts off is called 1 recharge. The assumption here is that compressed air is not being used while compressor motor is activated. If you need high volume of compressed air, like for large area painting or machine operations. you’ll probably need a the traditional “loud” version of the air compressor. Air compressors requires you to release all the compressed air in the air tank (air vessel) at the end of every day and for you to drain any condensation inside via a drain plug below. Also, you will need to clean the intake air filter once a month for maximum efficiency. Cleaning the air filter is as easy as using an air gun to blow through the filter gently. Feel free to let us know what you need for your compressed air requirement. We will be glad to help you as much as we can.